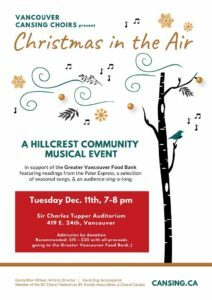 CanSing » Blog Archive » CHRISTMAS IN THE AIR (VCS GREATER VANCOUVER FOOD BANK FUNDRAISER) Tues, Dec 11th, 7 – 8pm, Tupper Auditorium. CHRISTMAS IN THE AIR (VCS GREATER VANCOUVER FOOD BANK FUNDRAISER) Tues, Dec 11th, 7 – 8pm, Tupper Auditorium. What gives us the most joy during the holidays? It’s the gifts we give to others and the Vancouver Cansing Choirs, Hillcrest Neighbourhood not only bring the season alive with their beautiful singing but their Christmas Show is an annual fundraiser for the Greater Vancouver Foodbank. Last year, the singers raised over $2000.00. This is the fourth CHRISTMAS IN THE AIR benefit and is a wonderful way to hear seasonal selections including Brian Tate’s THIS WINTER’S NIGHT and Chuck Bridwell’s crazy NUTCRACKER JINGLES, woven with readings from Chris Van Allsburg’s Polar Express. The audience sing along is always a highlight! Invite your family, friends and neighbours! Admission is by donation ($15 – 20.00 suggested amount). All proceeds will go to the Greater Vancouver Foodbank (NO FOOD ITEMS PLEASE). With each $1 VCS Choirs donate, GVFB can purchase at least $3 worth of nutritious groceries and fresh produce for the thousands of people they support each week. Family and friends are welcome! This entry was posted on Tuesday, November 27th, 2018 at 10:03 am	and is filed under CanSing Presents, Welcome to CanSing. You can follow any responses to this entry through the RSS 2.0 feed. Responses are currently closed, but you can trackback from your own site. « VANCOUVER CANSING CHOIRS: WE ARE THE MUSICMAKERS, 7pm, Friday, Nov 16, Charles Tupper Auditiorium. VANCOUVER CANSING CHOIRS: WE ARE THE MUSICMAKERS, 7pm, Friday, Nov 16, Charles Tupper Auditiorium. Registration is open for Vancouver Cansing Community Choir’s 9th season! CHRISTMAS IN THE AIR, Tuesday, December 12th, 7 – 8pm. Tupper Auditorium (419 E 24th). VANCOUVER CANSING CHOIRS: TO THE SPIRIT OF SONG, 7pm, Friday, Nov 17, Charles Tupper Auditiorium.